Haunted Asheville presents . . .
Asheville & Vampires & Witches & Ghouls? * We border Transylvania County. Why is it called Transylvania? * What is the true agenda of the Freemasons? 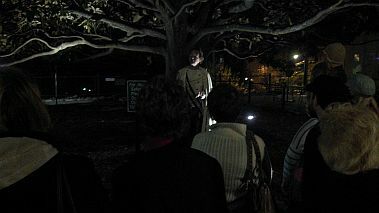 * Why is a "witch's tree" in our city-county plaza? * What was the bizarre creature that terrorized our jail inmates in 1908? * Are some buildings in our town truly "demon possessed"? 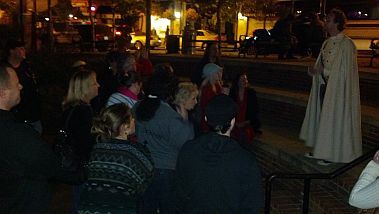 "We took this tour which focused less on ghosts, and more on the historical origins of the early settlers of Asheville and the superstitions, rituals, customs and folklore they brought with them. Our guide Tadd was a very enthusiastic and animated storyteller, with a seemingly endless knowledge of the area. No questions were off limits, and our group of 3 couples drilled him on everything from werewolves to witchcraft to the Illuminati. One of our group members called this tour "life-changing." It certainly sheds a new light on many things I just thought I understood. Highly recommended." THIS 2-HOUR WALKING TOUR is the ultimate for adult intellectuals who want to take a step outside the bounds of a usual tourist experience. Your knowledgeable guide will explain what Freemasonry is all about, and explore the conspiracies with you. Next we'll pass through some alleyways where dark and tragic events have transpired. You'll then get the full scoop on our local vampire scene, tribal rites in Pritchard Park, dark spirits on Church Street, Native American mysticism, and much more. 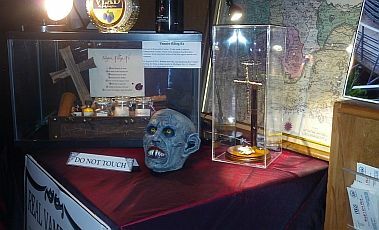 This tour includes late-night access to the Asheville Mystery Museum where you'll see artifacts Joshua P. Warren brought back from Transylvania, including a sacred crucifix and a piece of Vlad the Impaler's Castle. This is Warren's favorite tour! Please DO NOT enter the Masonic Temple without a guide since private functions may be taking place inside. Questions? Email Tadd McDivitt, Chief Occult Researcher of the Asheville Mystery Museum, at: contact@HauntedAsheville.com or call (828) 398-4678. 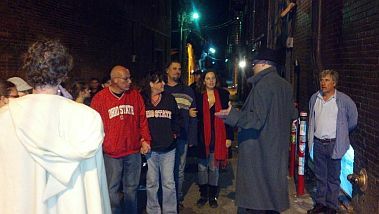 The tour leaves from the creepy alleyway behind the Asheville Masonic Temple at 80 Broadway downtown. 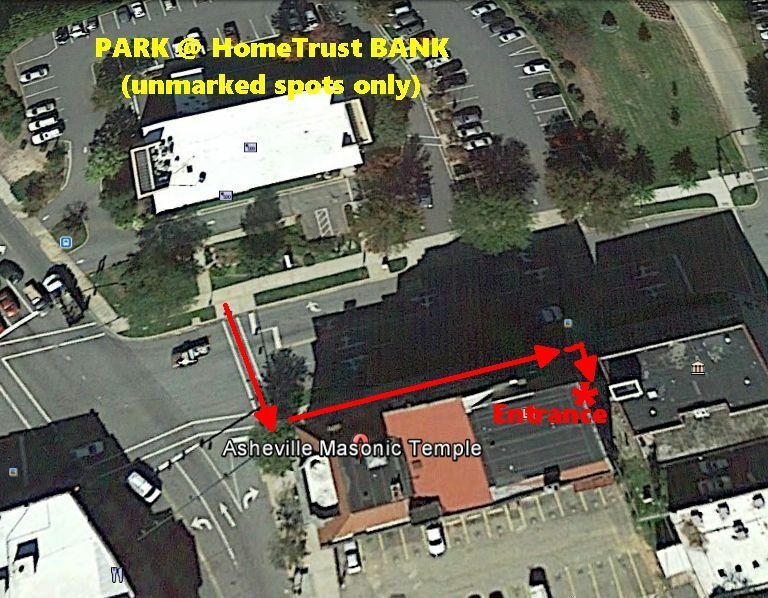 If spaces are available, you can sometimes park, for a fee, at the HomeTrust Bank, located at 10 Woodfin Street, beside the Asheville Masonic Temple. For directions, click HERE. Parking is also available right beside the Temple for a fee, or you can park for free in public spaces in downtown Asheville, after 6pm. But, regardless of where you park, you will still need to enter the alleyway from the HomeTrust Bank side of the street. Just show up 10 minutes before your tour time in the creepy alleyway behind the Asheville Masonic Temple, at 80 Broadway Street. Please DO NOT enter the Masonic Temple without a guide since private functions may be taking place inside. You MUST purchase your tickets online now, in advance, using a credit card or your PayPal account. To do so, just choose the tickets for the night you want. Again, please DO NOT enter the Masonic Temple without a guide since private functions may be taking place inside. It's $22.95 per adult, $15 for children age 9-14. Age 8 and under is free.